We now have a defibrillator at Community House! We are please to announce that we now have a defibrillator available for public use at the front entrance to Community House. 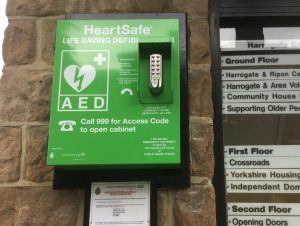 The defibrillator was donated by the friends and family of Lizzie and Alastair Hughes who have worked hard to raise the funds needed to provide better facilities in the community. Alastair suffered a cardiac arrest at the age of 37, but following urgent treatment is now thankfully fit and well. His wife Lizzie works with the HELP team here at Community House. We are very grateful to Alastair & Lizzie for their generous donation.